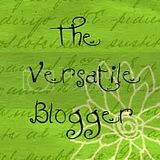 You KNOW you are busy when you forget your own blog-anniversary! 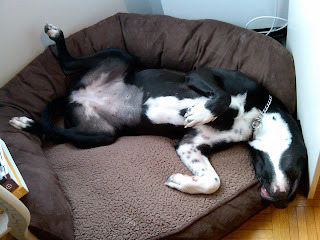 On March 11, 2011, a mere three months after Havi adopted us, we started this blog. 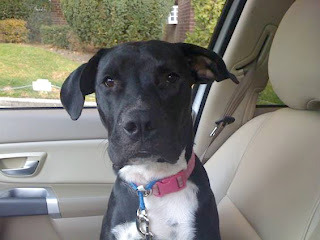 We were inspired by other pitbull blogs and our numerous adventures. Why did you stick with us this year? What do you like reading about? A while back we posted a little montage about when we first met Havi. 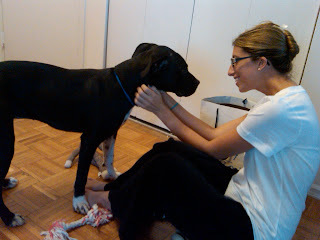 I had noted that I was scared of ALL dogs before we adopted Havi. Two Kitties One Pittie wanted us to expand a little on this. Havi and Law Student's first photo! It is true. Im a recovering scaredy cat. (No offense cats!) Even the little fluffy ones were a little scary to me. And a pit bull?! Isn't that the kind of dog the neighboring Frat House had in college that bit a woman?! I vividly remember when a neighbors beautiful black lab got loose and I was alone outside, I was terrified. 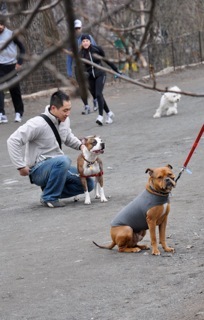 When another neighbor got a shih-tzu, I wanted nothing to do with it. In life, sometimes you get that feeling. You know that "this just feels right" kinda thing. Perhaps it happened at a job, when you met your mate, or bought your first house. For me, it was when my parent's neighbors/Havi's foster parents sent a photo of then-Baby to me to send around to my friends. Instead, I stood up in my cubicle in the library grabbed my phone and called Dental Student. As anyone in my life or on Pack Walks can attest to - I am very Type A! Just standing up and claiming we need a dog without a plan is very unlike me. When I played with Havi the first night in the backyard of my parent's house I was secretly terrified. Then the first night we adopted her, when she was alone in the bed with me for a little, I couldn't sleep. I don't know what it was, but Havi is the ultimate teacher. 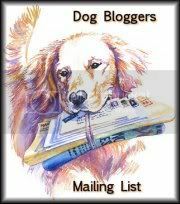 I mean, I write a blog about a dog. I know every dog in our large NYC high-rise. I know the pups in the local dog run. I volunteer at a shelter. I am no longer scared of pups, and I owe that to Havi. For 20+ years I was missing out on so much. Who can be scared of this silly girl?! 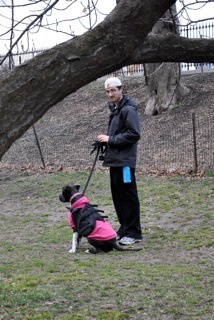 What has your pooch taught you? Thank you for your patience with the sparse posts this month, life became overwhelming! We are doing a NYC Small Business Promotion Week next week! Stay Tuned! 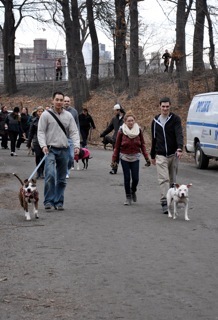 After our last Big Apple Pittie Pack Walk, we realized that everyone comes to our walks for different reasons. For three pups and their foster parents, its to get their pups "out there." 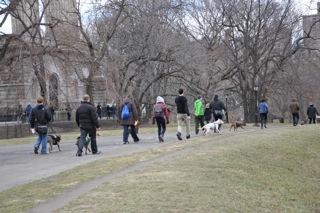 Any exposure is good exposure and meeting like-minded pooch owners on a long walk through a different part of the city is a good way to get noticed! Blueberry is a three year old GORGEOUS blue nose weighing around 70 lbs. Don't let the cropped ears fool you - this boy is a MUSHMUSH! Blueberry is an extreme snuggler and loves to cuddle and make out with everyone he meets, and is a bit of a celebrity in his neighborhood. Blueberry is good with dog-savvy cats (he will chase and play with cats like they are dogs, so cats who don't love dogs will likely find him annoying) and most other dogs, and is great with kids who don't mind being knocked over occasionally. He currently lives with 3 cats, 2 other dogs, and has lived with an infant and children 7+ previously. Blueberry is well trained but extremely stong and energetic so would love to be with an experienced family who is home often to entertain and exercise him, and another dog to keep him company would be a plus. 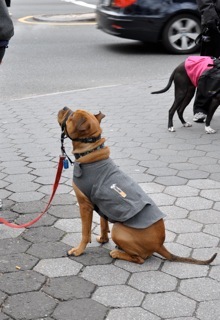 Law Student chatted with Carlos' Foster Parents this past walk. Carlos is one lucky guy! His parents are awesome trainers, and Carlos is so quick to respond. He lives with his foster sibling Little Bear and has been in his foster home for two years! Can you believe it?! A guy this handsome...Carlos' foster parents even started a blog to help him find his forever home. Pinky has become our little mascot on BAPP walks. She takes tons of photos, and they are always of her leaning on someone! Havi even set up a dating profile for Pinky once. Do you know anyone who wants a Blueberry Mushball? Maybe a well-trained Carlos? Are you in the market for a Pinky-cuddler? Email TwoGradStudentsandaPittie@gmail.com. Or if you have some suggestions for these three pups - leave it in the comments! P.S. 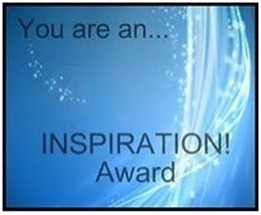 Next week we are doing a spotlight on local small businesses - have one? Email us! 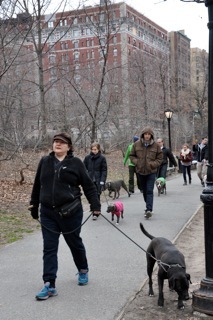 Well after a week of the flu and a week of Spring Break, we were very excited to get back to our lives on Saturday with a St Paddy's Day Big Apple Pittie Pack Walk. 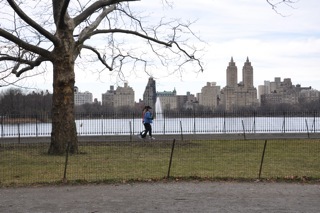 We did a familiar walk, the Riverside Park South Promenade. This is a beautiful walk down the West Side of the City. We watched the sun play on the Hudson River while working on walking past runners, cyclists, and some off-leash dogs. We had 15 amazing pups and their families join and everyone seemed to form the perfect pack! These two new pups were the best trained pooches! This puppy let everyone know how EXCITED she is! Pinky joined us again as a green dinosaur! 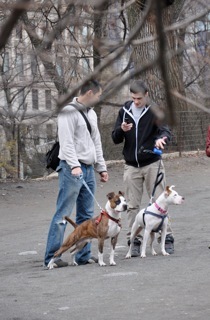 Want to join the Big Apple Pittie Pack?! Join our MeetUp Group! We also appeared on Page 18 of Saturday's Daily News! Check it out! 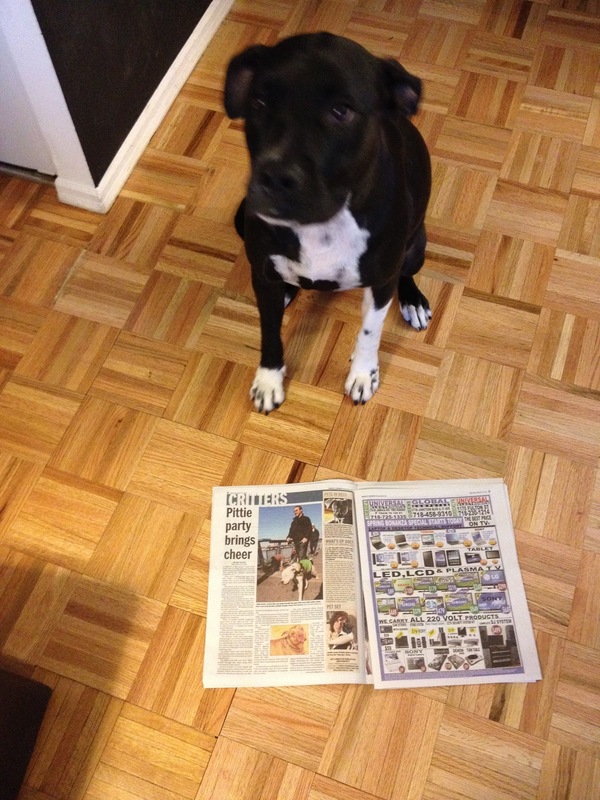 In our Monthly Feature we chat about our small budget and our big pup! Pork Chop and his cute underbite joined us for his first time! 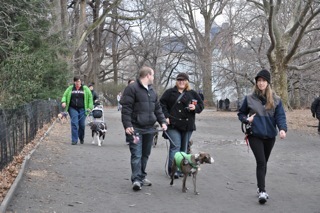 We certainly looked like a parade of pitties! We had a lot of people stop and ask what we were doing and got a lot of positive feedback! Thank you to all our new members and thank you for all of the support. O this has got to happen more often- that face!!! She was extra cuddly and cute when I let her out and she seemed more calm than usual while I put her harness on (I managed to clip it before she roly-polyed me). We had to wait a bit for the elevator because only one was working and they kept being packed by the time they got to us but she sat like an angel and impressed each closing car full of people. She did snap at a puggle from the North Side (those North side pups just don't know what's up!) but the other dogs we passed on the way to the park she was great with. And we got to see Jophie again outside the building! I topped off her water in her crate and gave her kisses goodbye before her milkbone. Until next time!